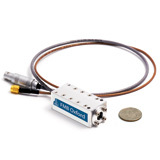 The FMB Oxford APD detector is an ultra-fast detector system using an avalanche photodiode, for X-ray scattering experiments up to 20keV. It offers the ultimate in speed, resolution, efficiency and noise levels whilst maintaining a robust and easy to use architecture; making it ideal for experiments with a large dynamic range, time resolved measurements and fast photon counting. The system requires an APD detector head, signal processing electronics and a signal cable. This section details the APD detector head and the two processing modules offered by FMB Oxford. The FMB Oxford APD Detector Head comes in three standard formats, 5×5 rectangular body, 5×5 cylindrical body and a 10×10 transmissive version all with integrated preamplifier, in the housing.